← Interactive GPS art • Grab a pencil! Why spend $5.99 on a Hallmark card when you can wow your Valentine with a city-sized expression of love? It was Valentine’s Day 10 days ago. Don’t get me wrong. I’m all for true and heartfelt love. I just don’t want to have to prove it with my Mastercard lest I get banished to the doghouse for several days after the 14th of February. Okay – so let’s say I’m gonna take my chances and try to dodge the doghouse by sending a big card that oozes with sentimental gooeyness. At Hallmark.com, the biggest Valentine’s Day card they’ve got – a scant 5 x 7 inches – will set me back $5.99. Plus $1.99 for shipping. Plus tax! Thank goodness for my Garmin, my bicycle and Strava.com (whose tagline, coincidentally, is “Prove it”). Early in the morning on February 14, I snuck out and sketched this massive Valentine’s Day message for the love of my life. Sure, it took several hours of planning and a couple hours of pedalling around Victoria in the dark and the drizzle. But I saved nearly 10 bucks, wowed my wife AND made every other husband in my cycling club look like a lazy, inconsiderate oaf. 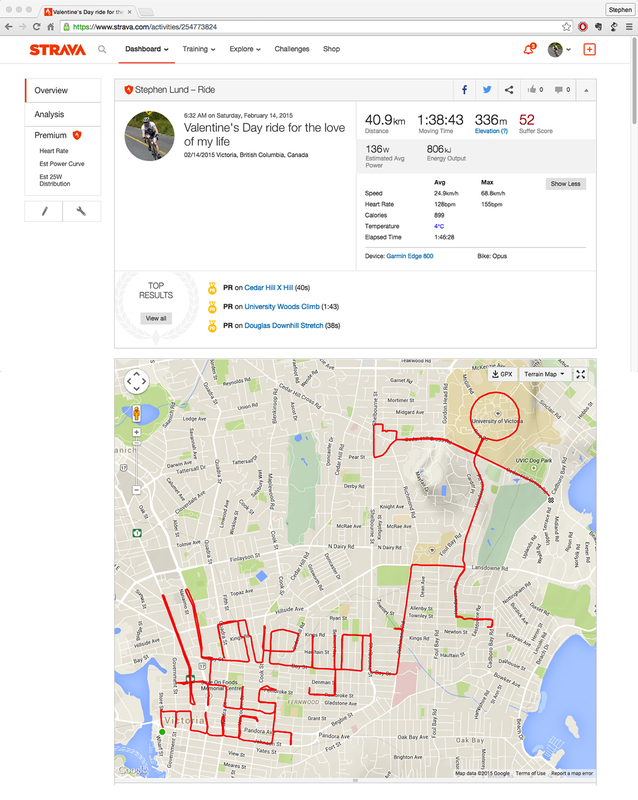 This entry was posted in bike-writing, gps art and tagged bicycle, bicycling, bike-writing, creativity, cyclist, garmin, gps, gps art, love, strava, strava art, valentine's day, victoria bc. Bookmark the permalink.